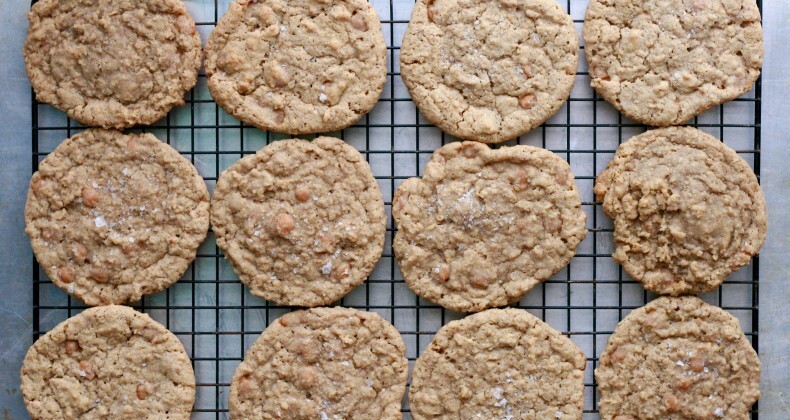 Salted Caramel Oatmeal Cookies are EVERYTHING! They are chewy from the oatmeal, sweet from the caramel bits, and salty from the Maldon flake sea salt sprinkled on top. They pair perfectly with a big mug of coffee or a giant cup of chai. This will be your new favorite fall cookie. These cookies feature one of my favorite seasonal items… caramel bits. Have you seen them in the stores yet? They are round little balls of caramel. They can be found in the seasonal baking aisle or over by the chocolate chips. Pick up several bags so you can make these cookies all winter long. I am going to have to run to the store this week and stock up since I am planning on baking these for our school’s bake sale. The caramel bits add such great texture to the cookies. Mostly they melt down into the cookie but occasionally they remain in their little caramel bit ball form which provides an extra chewy texture. My family loved it. Once the cookies were done baking I sprinkled them with a little pinch of Maldon sea salt flakes. If you are lucky you will get a chewy caramel bit and a crunchy sea salt flake in the same bite. Welcome to cookie nirvana. Tell me what is your favorite fall cookie? Well, these look absolutely delicious! I’ll have to sub out the regular flour for gluten free and give this a whirl! Let me know how they turn out. Do you have a favorite gluten free blend? These look great! I love oatmeal cookies and I love salted caramel. I haven’t seen the caramel bits in stores yet–I’ll have to keep an eye out for those. I hope you can find them in the stores. Maybe you can order from Amazon? I love oatmeal cookies, but I’ve never had a salted Carmel one! Sounds delicious! Pinned. Ha! I love the way you think! These cookies are totally up your alley then. I hope you enjoy Claire! These look really good! I’m not a huge fan of oatmeal cookies but the addition of caramel sounds good to me! The caramel and oatmeal work so well together. Oatmeal cookies aren’t high on my list of favorites but I found myself with a lot of oatmeal given to me from friends and I needed to use up some of my stash. These cookies look delicious! Salted caramel is my new favorite thing! You’re right, I do! I have the pin it button in my toolbar so it never crossed my mind to have it on my site. Thank you for that Jessica! These look easy enough for a non-baker foodie to make. LOL Maybe Santa would enjoy these this year. Keri they are easy and I am certain that Santa would LOVE these! I’m doing a cookie exchange in November…this is definitely a contender–if I can find the ingredients! I hope you can find them! Maybe you can order the caramel bits from Amazon? I might seriously have to give these a try with a gluten free flour and a dairy-free butter option. They sound amazing! If you do please let me know how they turned out. Do you have a favorite gluten free flour blend you use? I am also into salted caramel everything! I crave salted caramel mochas (both in the frappe and hot versions) all year long! Have you tried the dove dark chocolates filled with sea salted caramel? If not, you need to! They are the perfect afternoon sweet treat. I have a bag in my desk drawer at work. Do NOT tell my coworkers or they will be gone! These sound delicious and I love how you photographed them in that tube! What is it? Thanks Natsha! I used a bread pan to hold the cookies. Ahhhh, these look amazing! I also have a sweet/salty tooth. Salted caramel FTW! Pinned it! Oatmeal cookies are one of my favorites, so I’m definitely going to have to try this. 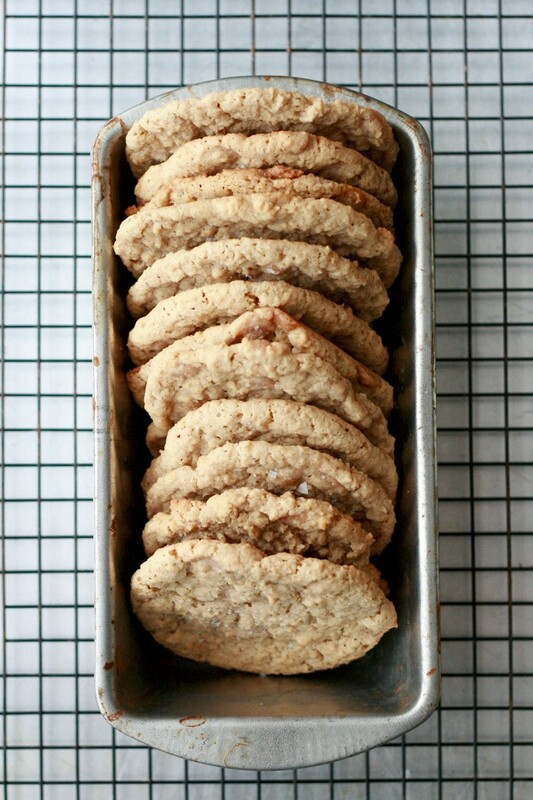 By the way, love the photo of cookies in a baking pan. That would be a clever housewarming present for someone (using a new baking dish of course). Love the presentation. On the advice of a friend, I made these for a church coffee hour…they did not last the hour! I found that a liberal sprinkling of coarse kosher salt worked well in place of the Maldon sea salt flakes. Yum! I’m going to try freezing some of the caramel bits to keep them more intact. Let me know how that goes! You might need to adjust the baking time slightly. I am so glad to hear it! <3 These are a favorite in my house. I made these again but this time reduced the caramel to 6 ounces and added Macadamia nuts 2 ounces and White Chocolate Chips 4 ounces.. They were good too!